Some recipes have a great story. One in particular is tortellini, a stuffed pasta. It is believed to have originated in the Bologna region of Italy around the 12th century. There are several versions of its mythical beginning, but the story is that the gods Venus, Mars and Bacchus came to earth to intervene in a war between the towns of Bologna and Modena. The three decided to stay at an Inn for the night. The next morning the innkeeper somehow caught a glimpse of Venus’s navel and was so spellbound that he immediately went to the kitchen and created the navel-sized tortellini in its image. Thankfully, I have never looked at a bowl of tortellini and thought I was staring at a cup full of goddess navels. I do however think that it’s one of the most delicious pastas to eat, and if prepared right, can almost be a religious experience. 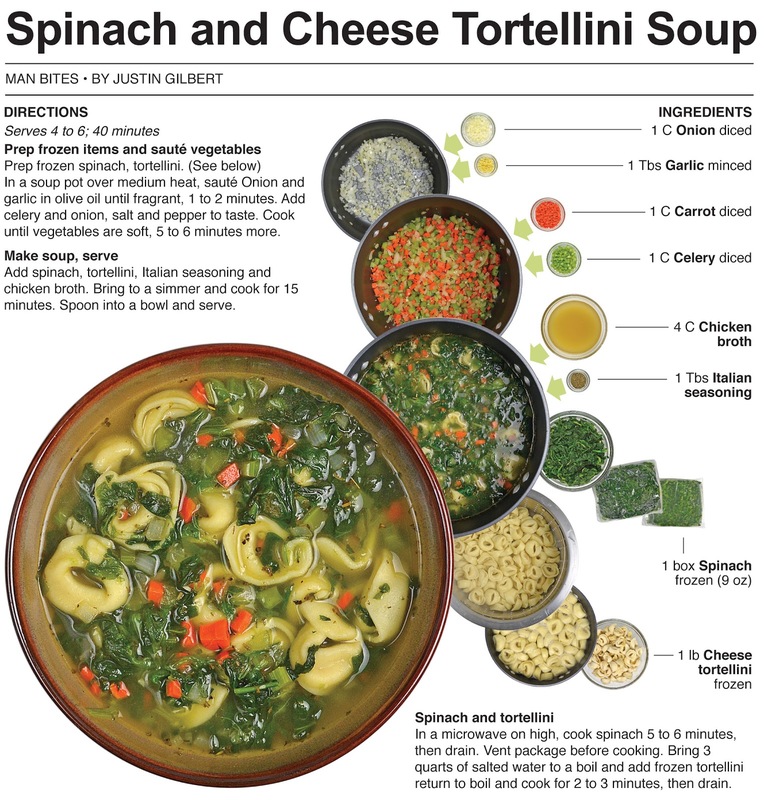 For this recipe, I make a cheese tortellini and spinach soup and I dedicate it to the many different belly buttons around the world. I love researching the recipes I create, and what I found with this one is the reason why. 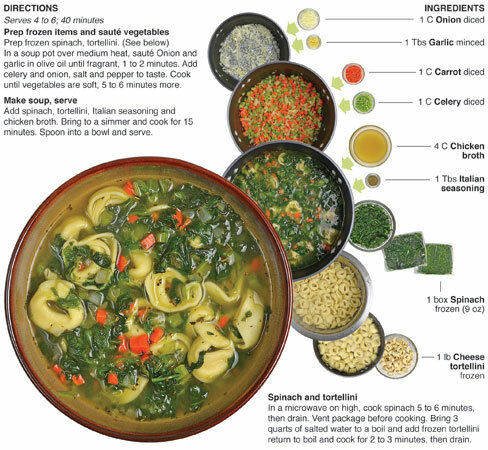 Tortellini inspired by the navel of a goddess – that’s gold. I do think it’s a little gross though, obviously the person who spun this tale had some sort of belly button fetish. Probably some weird response to the sexual repression of the dark ages of Europe. Personally, I have never thought twice about navels. Well, that’s not true, every once in a while I see a weird outie navel and get slightly creeped out, but beyond that, it’s not something I think about. I don’t think I’ll be able to eat tortellini without recalling this story. It won’t deter me from eating the pasta – I will just consume it with a little nostalgia from now on. In a microwave on high, cook spinach 5 to 6 minutes, then drain. Vent package before cooking. Bring 3 quarts of salted water to a boil and add frozen tortellini return to boil and cook for 2 to 3 minutes, then drain. In a soup pot over medium heat, sauté Onion and garlic in olive oil until fragrant, 1 to 2 minutes. Add celery and onion, salt and pepper to taste. Cook until vegetables are soft, 5 to 6 minutes more. 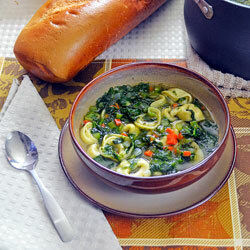 Add spinach, tortellini, Italian seasoning and chicken broth. Bring to a simmer and cook for 15 minutes. Spoon into a bowl and serve. Interesting story LOL. So, it's basically a wonton soup then, sounds delicious all the same. I like the mythological story! It's spelled navel, not naval (of, in, or relating to a navy).